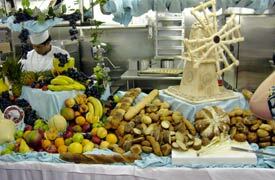 ABOVE: Bread and roll arrangement at Silversea's traditional Galley Brunch, where passengers raid the kitchen on a day at sea. Should you consider a Silversea cruise? That depends on your budget and what you're looking for in a cruise. A Silversea cruise is expensive, with published fares starting at around $700 per day per person. However, some itineraries are less costly than others, and discounts for early booking and repeat cruises often bring the price down considerably. Some "Silver Sailings" have cruise-only fares that start at $350 per day. The passenger makeup is also something you'll want to consider. Like other luxury cruise lines, Silversea's demographic is skewed toward middle-aged and older travelers who are more likely to spend their time in country clubs than in hip-hop clubs. Still, not everyone is old enough to be your uncle, grandmother, or sugar daddy; on our "Scotland's Tattoo" cruise, we dined with two charming young women of 23 and 14 one evening; and on our previous Silver Whisper Mediterranean cruise, the passenger list included a surprising number of teenagers and children from Italy, the U.S., and other countries. Finally, if you don't speak English (as you almost certainly do, if you're reading this article), Silversea may not be the best cruise line for you. Silversea's clientele is split roughly 60-40 between Americans and passengers from other countries, and English is the lingua franca used by Silversea's multinational crew and guests. For more information on the Silver Whisper and Silversea Cruises, see the Web links on the next page.